Get free admission to the show! is free for each night you stay! Please phone the hotel at (310) 410-4000 to make reservations. Or you can go to www.hilton.com and select Hilton Los Angeles Airport (or click here). The fun starts at 8 PM. The best part, no cover! 21 years and older only. Brought to you by the Hilton Los Angeles Airport..
RARE COLLECTIBLE AT GC 42! sale at the GOLDEN APPLE tables this weekend. the bargain price of only $20 each. Samy's Camera will be displaying some of the hottest new equipment for photographers during the show and workshops. Photo Seminars, Workshops and Sessions. 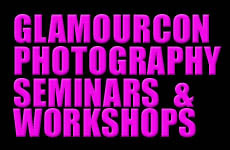 We will announce the classes & Schedules on www.GlamourconWorkshops.com soon. Check in often. Seats will be limited, so you'll want to jump right in at registration time. Click on the link below to get the most up-to-date information. As a tiny sneak peak, the fabulous JAIME HAMMER will be appearing in our exclusive workshops. of his best selling photography books. "The Sexiest Starlet In The Biz"
and pinup cartoons of fans and guests. Artist series pinup wine labels and wine accessories. MS. KONNIE from CAL MALAY, Inc.
UPCOMING CYBER GIRL OF THE WEEK, OCT. 15TH! Check out their great guest list!